Fifth post in a series from our staff-led Institute Day. From crowd-sourcing key info for a study guide, to team-building and friendly competition in Greek Game simulation, to collaborating on data collection, and peer editing, the strategies shared will inspire you with new ideas for your own courses to engage your students in their learning and collaborate with classmates. 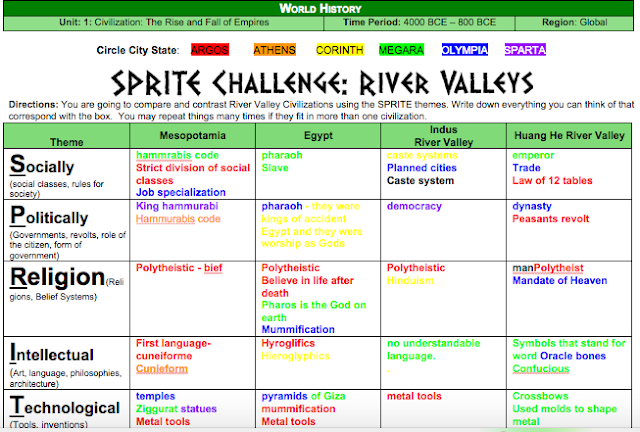 Chris Cirrincione shared an example of how students "crowd-source" key info on Ancient civilizations using a Google doc with color codes to distinguish groups' participation. To ensure engagement on the Doc, Chris scaffolds a prior step. He has all of the students do pre-work on a printed version of the doc so they come prepared to collaborate with their groups on the Google Doc. Once they begin collaborating on the doc, the colors serve as a formative assessment tool. For example, a quick glance at the doc (see below) reveals little participation by the orange group, so Chris made sure to check in with that group to help them get back on track. Chris also uses Google Slides for collaboration with his Spanish classes. Working in groups, and on the same slide deck, students demonstrate their understanding of vocabulary by making slides with visuals and using the words in a sentence to demonstrate their understanding. 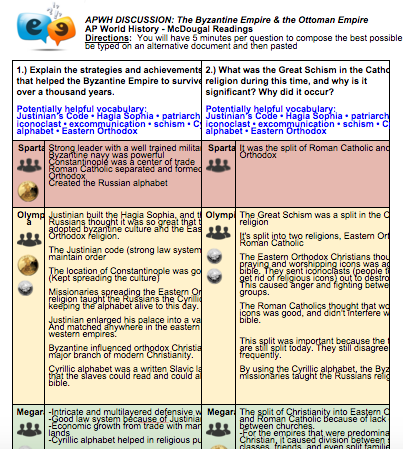 Students can peer-edit slides, Chris can formatively assess and give feedback as they work, and the final product serves as a wonderful study resource for all of the students in the class. Sandra Lee shared examples of how her students use Google Docs to peer edit writing. Students work in pairs and use colors to identify evidence of quality writing on the rubric. Like Chris, Sandra uses this as a formative assessment tool. She circulates during the activity to check the students work. At a glance, due to the colored annotations, Sandra can confirm understanding of the writing process and provide support as needed, and even diagnose common challenges that she can address with the entire class. Dan Davisson also uses Google Docs and Google slides to have his student collaborate, and even compete, to demonstrate their understanding. Working in groups, students collaborate on a specific secction of the doc, trying to finish before other groups. At they same time they can "overtake" a group by closely attending to their work and adding missing information. Once students complete their section of the doc or slides, their work serves as a resource for all of their classmates for future study. You will notice that Dan reinforces key vocabulary by including a list of key terms in the instructions (in blue) that students are encouraged to use in their writing. Dan even includes a gaming element to encourage quality work. Dan follows their work as they write (more formative assessment!) and students are awarded badges depending on how well they complete their sections (in depth work/analysis, making connections, using vocabulary etc). These kind of activities serve as a variation of peer editing that Sandra does. As students complete their own sections they are continually checking each other's work to add missing information. The combination of collaboration and competition and gaming elements really works well to get all students engaged! And they have fun too! Krista Glosson shared examples of how students collaborate on Google docs to gather data for experiments. This activity builds in authentic accountability, as students depend on the data entered by their classmates to analzye their hypothesis. Students work more efficiently as well, by collaborating on the data entry and compilation. As a follow-up to their Institute Day session, Chris, Dan, Sandra and Krista hosted a Teaming on Tuesday demonstration in the Collab Lab and/or a Peer Observation invitation to see these strategies in action in their classrooms! A huge shout out to them for sharing their practice with us with great examples from their students! Do you want to learn more? 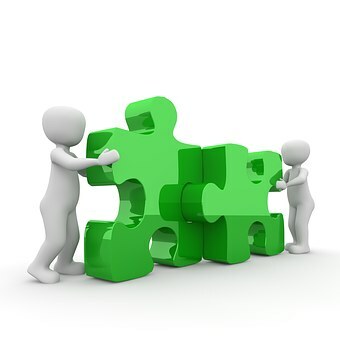 Do you have student-engagement/collaboration strategies to share? Come see us in the Collab Lab! . . . or leave a comment below. This is the immense news for the general population who are to an incredible degree on edge to help the convective marvels which have mind blowing imaginative highlights related with practical expressing to pick up the epic thought. Check this college paper review and get various new contemplations and strategies.